Military Tops National Confidence List. Congress and Media Near Bottom. If you remember the Vietnam era, it seems unbelievable the U.S. military is the institution Americans have the most confidence in. The military has been on top since the 1990s. And why not? They are professional, disciplined, have honor and mostly get the job done. In fact, if you were asked what Americans are really good at in 2011, it would be war. From high tech to low tech, big engagements to small raids, U.S. forces are dominant. Our best export is organized violence. There are times our missions are unrealistic and strategies unfounded, but generally, we can make war better than most anything we do. 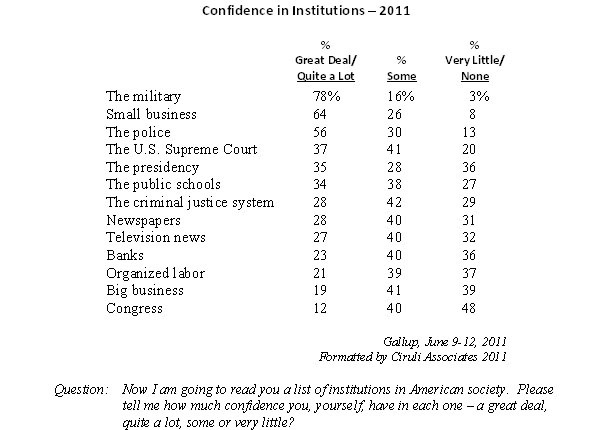 Unfortunately, Americans have much less confidence in their form of government. Congress is at the bottom of the list, with the other two branches only getting about a third of the public saying they have “a great deal” or “quite a lot” of confidence in them. Another bulwark of democracy, the media, is now closer to the bottom of the confidence list than the top. Newspapers and television news nearly tie with 28 percent and 27 percent of the public, respectively, saying they have confidence in them. There are some interesting pairings. The criminal justice system only received 28 percent level of confidence, but police are near the top with 56 percent. Big business and banks are near the bottom with less than a quarter of Americans having confidence in them, but small business is second in rank on this list with two-thirds of Americans saying they have confidence in it. Organized labor is near the bottom with 21 percent confidence level and public schools, increasingly associated with their unionized staffs, has the confidence of only a third of Americans. President Barack Obama won Colorado in 2008 by a landslide. Democratic presidential candidates have only won four times in the 62 years since the Roosevelt era. Not only is it unusual for a Democrat to win Colorado’s electoral votes, but it is more astonishing for them to win above their national average. Obama’s 9 percentage point victory margin was 2 points greater than his national win. But, there are a host of factors that make a repeat performance difficult, and Obama could lose Colorado. · In 2008, Democrats were coming off both Colorado and national sweeps. In Colorado, the 2006 election gave them the governorship, a congressional seat and more control of both houses of the state legislature. Nationally, they won the U.S. House and began the brief Pelosi era and took control of the Senate. But, in 2010, Democrats lost two congressional seats in Colorado, contributing to Pelosi’s loss of the speakership, and they lost control of the State House of Representatives and all the statewide constitutional offices. They did hang on to a Senate seat and the governorship, but in both cases, good fortune helped at least as much as good campaigns for the trend was bad. · The economy is the issue and the recovery is slow in Colorado, with state and local government budgets still dealing with cuts. Unions remain on the defensive, with considerable resentment over pensions and pay for the public sector. The economy is now Obama’s and not Bush’s. While he may have inherited the problem, it hasn’t improved fast enough. · The political passion Obama mustered among minorities and the young in 2008 appears to have cooled, and Colorado’s Tea Party matched it in 2010, even if some of their ardor was for flawed candidates. Their issues of deficits and growth of government reign supreme today. · The 2010 Colorado Senate race showed independent voters are the critical swing group and they are up for grabs. Obama was an encumbrance last year with independents. It will be impossible for Obama to make the case he’s outside the political wars of Washington as he did in 2008. And, by most polls, Obama’s liberal image has been increased while liberalism as a preferred political philosophy remains popular with only about a quarter of the population. · The Republican nominee will be important, but he or she will not be George W. Bush with the Iraq War as the backdrop. That fact alone will be worth a couple of points for the Republicans. Although Bill Clinton won the state in 1992, he lost it four years later by 2 points to Bob Dole, who he beat nationally by 8 points. Clinton won re-election, but not with Colorado. Colorado will be a battleground state. The Obama campaign expects a tough fight, which they think they can win as Michael Bennet did in 2010 – close and mean. American support for foreign military action has collapsed. President Obama’s effort to get out of Afghanistan is barely ahead of public opinion. The modest U.S. effort in Libya has also lost support. Democrats are the least supportive of the Afghanistan troops commitment (67% say troops out), but Republicans (54% oppose) are now less supportive than Democrats in Libya. Regional competition for the convention business is natural. Suburban areas will find developers who want to use tax subsidies to build major convention facilities –and Aurora is an ambitious city. It is only slightly more than half the size of Denver, but fights above its weight. However, as a core city, it’s important for the region that Denver maintains and grows its job base. And, downtown Denver’s retail viability is key to the city’s sales tax revenue. Wellington Webb was a good mayor, but he failed to grow the Colorado 8th Avenue health science center. Now, it’s mostly a benefit for Aurora. John Hickenlooper was a good mayor, but he failed to resolve the stock show’s space problem. Michael Hancock should not start his administration losing the stock show to Aurora’s new convention center. It should stay close to downtown Denver. Schwarzenegger’s Political Career Over. Can He Still Sell Movies? Arnold Schwarzenegger, late in his term as governor, had a 39 percent favorability rating and a 55 percent unfavorable. In the latest California Field Poll, his favorability has collapsed to 20 percent statewide and only 10 percent in his home county, Los Angeles. While his term of office had ups and downs, the collapse was related to his announcement of fathering a child with his household employee. Twenty percent is a new low for California governors, and reflects that Schwarzenegger has no political base; not Republicans, conservatives, Democrats or liberals – they all have an unfavorable opinion of him. Gray Davis, who Schwarzenegger replaced after a recall, had a 27 percent final favorability, and a 41 percent today. Pete Wilson, governor in the 1990s, was in office during a calmer period and left with a 50 percent favorability. His current low rating partially reflects that a quarter (26%) of California voters couldn’t rate him. Schwarzenegger’s shaky personal life was always a greater threat to his career than political mistakes in office. But, Hollywood is amazingly tolerant of sexual and personal aberrations, and careers have continued after extraordinary controversies. So, Schwarzenegger can expect a recovery, although it’s hard to see a Kindergarten Cop or Twins as his next role. 2011 Denver Mayor’s Election is Over. New Era Begins. Analysis of the Denver mayor’s election was cut short by the media’s coverage of the prostitution allegation and its even more extensive explanation for media coverage rules and decisions. Former Governor Roy Romer, the father of Chris and an indefatigable campaigner, may have summed up his son’s mayoral campaign defeat best - his persona did not fit this electorate in this election. The candidates were similar on the issues but wildly different in life stories, and this election was about the candidates’ personalities and their backgrounds. Hancock’s personality was his greatest asset. Although his life story is less exotic than Barack Obama’s, his upbringing was much more challenging. It showed that Hancock’s good temperament is extraordinary in the face of chaos and tragedy. The ins and outs of this election highlight the narrative that dominated it – a narrative that will guide the new administration. Hancock’s career as a community activist and city official was comfortable for Denver, a liberal city and seat of much of the state’s government. Romer, an investment banker, was immediately handicapped with voters by having one of the least favored professions, as well as being the son of privilege. He tried to use his private sector credentials as an asset for creating jobs but many did not view mortgage banking in public finance as an attractive resume or even particularly private sector. Romer started with the premise that Denver was stalled and change was needed to “go to the next level.” Michael Hancock’s campaign recognized that voters expected some change, but didn’t really want that much. John Hickenlooper was judged a successful mayor, and Denver, albeit with some problems, a great city. They wanted someone to manage it, not change it, and Hancock said he had the city management experience to start on day one. Hancock has a friendly and easy-going personality, and it showed in his measured approach as a councilman and council/president. He emphasized collaboration and consensus. Romer chose an aggressive style and a tough guy image. He said it was needed to balance the budget and say “no” to city employees. Hancock made clear he was as concerned with social justice as a balanced budget. And in his view the budget would be balanced in the normal process without hardship. It may be that in the post Wisconsin environment, a Democratic city like Denver is less interested in tough budget cutting than fair budget balancing. Although Denver has never before elected a city councilperson to the mayor’s office, this turned out to be the year that continuity and experience on the job were valued. Hancock’s greatest challenge may have been getting past his fellow councilpersons in the general election. Romer hoped that another Hickenlooper-type was desired to bring a business approach and outsider’s perspective. Unfortunately the year was wrong, and Romer was no Hickenlooper. Not only did a positive campaign fit Hancock’s temperament, it also gave him a platform from which to criticize his opponent without looking negative. Arguably, the Romer campaign felt they had no choice but to go negative. It was clear his campaign had stalled before the general election and fell behind shortly after. However, the move to immediately attack caused a significant counter reaction. After the vicious Romanoff-Bennet primary last summer and the hard-fought fall Senate race, Denver voters simply had no stomach for another negative campaign. Also, Hickenlooper made not using negative advertising a signature attribute and a successful strategy. Romer’s negative ads, reinforced by the aggressive direct mail and robo calls from nominally independent big labor, reinforced his outsider, tough-guy image – a misguided approach for this electorate. Hancock had the benefit of being the favored candidate of most of Denver’s liberals and their powerful network. They, along with the African-American community, gave him his surge in the general election and protected him during the negative onslaught. They made it clear he was their candidate on school reform. Even though both Hancock and Romer had similar platforms and credentials, the endorsement of Romer by the usually powerful teachers’ union may have backfired, sending any reform-minded fence sitters into Hancock’s camp. Romer’s effort to unite Republicans with centrist Democrats and Latinos was a difficult strategy, especially when running against a popular African-American candidate. The narrative of this election will define the new administration. Expect the familiar, with more continuity than change. An indicator is that the transition committee is made up of well-known faces. Necessary budget cutting will be done, but likely without draconian cuts. Whether it is the right civic narrative for the challenges Denver faces remains to be seen, but it will have a Hancock personality, friendly and consensus-building. Politics in Larimer County is far more complex than a simple two-party system. As a previous report on Larimer County politics described (June 21), the partisan identity of local voters varies from strong partisan (21% for both strong Democrat and strong Republican) to weak partisan, independent leaning and pure independent voters (42% of voters) (see first column on table below). 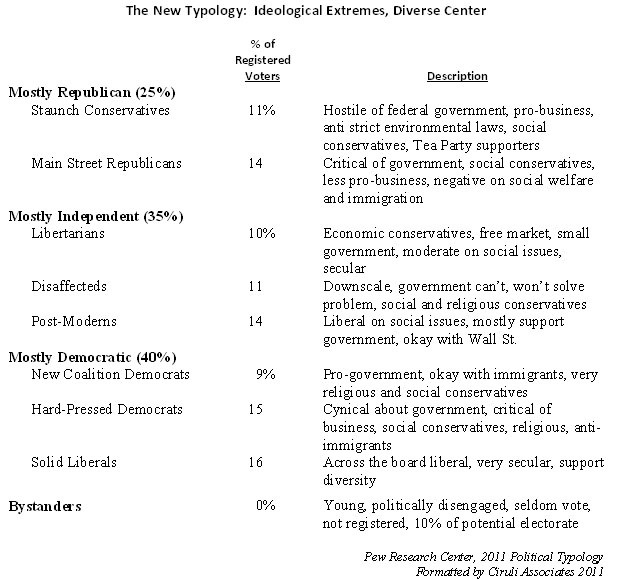 Variation is also reflected in voters’ self-described political philosophy, which includes a contingent of strong ideologues leaning 2-to-1 conservative (9% strong liberal versus 18% strong conservative), and an overwhelming 70 percent of voters identifying themselves as middle-of-the-road or moderate leaning either right or left. Although self-identified conservative and conservative leaning voters exceed liberals (strong and leaning) by 42 percent to 31 percent (see top row of table below), the middle-of-the-road voters clearly hold the balance of power in Larimer County and are prepared to vote for more liberal candidates under the right circumstances. 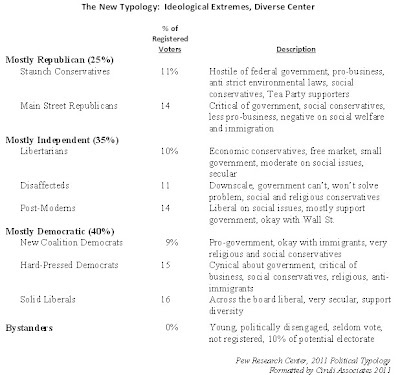 When party self-identification is compared to a voter’s political philosophy (ideological self-identification) (see table above), 71 percent of strong Democrats call themselves “liberal” (which includes “very liberal” and “moderate lean liberal”). Eighty-six percent of strong Republicans label themselves “conservative” (including “very conservative” and “moderate lean conservative”). Democrats with weaker partisan identity also are 10 points less liberal and more likely to label themselves “conservative” or “middle-of-the-road.” For example, a fifth (21%) of “not very strong” Democrats call themselves “conservative.” In contrast, the majority of Republicans from all partisan passions call themselves “conservative” (80% or more). A recently released Pew Research Center poll describing a more complex, but similar comparison in national politics, laid out eight politically active groups blending Republicans and Democrats with political ideology and used a cluster methodology that incorporated demographic characteristics and issue positions. The Pew typology provides an update and revision of a similar type of survey conducted in 2005. The major findings are that the U.S. political environment contains voters with strongly committed ideologies at each end of the political spectrum, and there is a growing middle of voters that hold strong views, but are hard to predict on a simple partisan or ideological scale. Nationally, in the Pew typology, there are more Democratic identifying voters than Republican (25% Republican and 40% Democrat leaning identifiers), and a third (35%) lean independent. The conclusion from this analysis is that although America may be represented by two parties, in fact, there are more than half a dozen different variations on the parties. And, there is a fragmented group that labels themselves and mostly behaves independent from the two parties, but has intense and eclectic political views. It is a trend that is evidenced among Colorado independent voters. After uniting the factions that make up parties, the modern politician must compete for independents, many of whom have very “unmoderate” viewpoints on major issues. Larimer County has become Colorado’s premier swing county, with both parties strongly contesting it. Republicans do better at the local countywide level, they control all three commissioners and all of the county offices, but Democrats – like Ken Salazar, Bill Ritter, Barack Obama and even Michael Bennet against neighboring Weld County DA – have been winning there in statewide races. A recent Ciruli Associates poll shows why. The county is in near partisan balance, with only a slight tilt to center right. Although formal party registration in the County Clerk’s Office shows Republicans with 40 percent of registered voters, Democrats with 35 percent and the balance unaffiliated (see first column on table below), in fact, when voters are asked their partisan affiliation, 27 percent volunteer Republican, 26 percent Democrat and 42 percent independent (see top row of table below). Nearly two-fifths of Larimer County voters (39%) do not claim to identify with the party they are registered with. Both Democrats and Republicans lose partisans and self-styled independents win. Republican and Democratic officeholders must compete for more than two-fifths (42%) of the electorate that considers itself independent of the parties regardless of their historic registration. Also, as the table shows, only two-thirds of registered partisans identify with their respective parties (65% of Republicans and 67% of Democrats). Twenty-eight percent of Republican registrants label themselves “independent” as do 29 percent of Democrats. These near equal percentages of the two parties do not see themselves as partisans and must be motivated by other factors, such as personality, track record of candidate and the issues. When Larimer County voters are asked their partisan leanings, they distribute themselves on a range from “strong Democrat” (21%) to “strong Republican” (21%), with similar passion at both ends of the spectrum. The center of the electorate is diverse and populated with weaker partisans of both parties and true independents (or at least voters who hate partisan labels). The weak partisan leaners in the 42 percent that claim to be independent are also closely balanced between Democrats (13%) and Republicans (11%) (see table below). Of course, candidates in both parties have the dual challenge of appealing to a balanced and moderate center of the electorate, while both parties are dominated by their most intensely partisan members in primaries and especially during the nomination process. Although the county’s voters lean conservative, 43 percent to 31 percent when leaners are combined with middle-of-the-road voters, the less intensely ideological voter represents a super majority of 70 percent of the Larimer County vote (see table below). Again, local candidates are challenged by a nominating system mostly controlled by strong partisans and more ideologically passionate voters. But, countywide voting is mostly in a moderate middle. Republicans have done better in recent years in countywide elections where personality and budget and management competence are the main issues. At the state level, where the issues are more controversial and polarized, Democrats have been winning a majority of county voters. There has been a long established consensus among American elites, and usually supported by a majority of the public, that the country must stay engaged abroad. Factors that can reduce public support have converged and are significantly impinging upon American interest in foreign affairs. Republicans have traditionally been most in favor of a strong military and have since 9/11 supported America’s war efforts. But today, they join Democrats in favor of America coming home. The factors that tend to undermine American interest in foreign engagements are wars going poorly or expensively and bad domestic economies or massive deficits. 2011 has all the factors. Partisanship always affects support for foreign involvement. Recently, Republicans had supported G.W. Bush’s interventions and Democrats backed Barack Obama’s. Democrats tend to be more dovish and have mostly quit Afghanistan and Republicans are supporting Obama much less than earlier in his term, including his foreign policy. See Pew Research Center article: In shift from Bush era, more conservatives say "come home, America"
There have been numerous occasions in Denver mayoral elections that the second place finisher in the general election wins the runoff. Michael Hancock, who was behind Chris Romer in the May 3 general election, beat Romer in a 16-point landslide June 7 runoff. Federico Peña in his 1987 re-election, Wellington Webb in his 1991 open seat and his 1995 re-election won after losing their respective general elections. Another way to examine the results is through the city precinct map. Tina Griego, Denver Post columnist, published them (general election and runoff) on June 9. Although Romer added votes to his general election total, examining the precinct maps shows, he, in fact, contracted on a narrow base of 114 precincts after having won 212 in the general election. Romer won few of Mejia’s precincts but lost more than 100 where he had received a plurality during the multi-candidate general election. Hancock’s 31,000 votes in the general election were concentrated in only 89 precincts. He continued to dominate those precincts at the 70 percent level in the run-off but expanded his support into the west side and down the central Platte Valley with the exception of the wealthy precincts points around Country Club. Also, Hancock won a significant number of precincts in the south central and southeast part of the city. Like his aggressive campaign, Chris Romer was the most zealous fundraiser, with $1.1 million raised and borrowed ($500,000) in the runoff. Due to his generally perceived trailing position, he was forced to loan his campaign money in the runoff. His total expenditure for the election was $2.5 million. Michael Hancock had a great May of fundraising as utilitarian contributors; i.e., interest groups and their representatives, rushed to get on the bandwagon. He raised $700,000 with no loans. He still trailed Romer in runoff fundraising by about $400,000, and overall by one million dollars. Nearly $2 million was raised in the runoff, leading to a new record of $4 million in campaign spending by top two candidates. A total $5.6 million was raised by the six major candidates. A few more voters turned in ballots in the runoff than in the May 3 Denver general election. But, the 42 percent turnout sets no record. In fact, there were more ballots in Federico Peña’s 1987 re-election runoff and Wellington Webb’s 1995 runoff. Once again, more than a quarter of the ballots arrived the last 48 hours, although people received the mail-back forms more than two weeks ago. One of the effects of all mail-back ballot elections is that the drama of a campaign’s traditional final weekend and Election Day activities is invisible. The bulk of campaign activities are in late direct mail and robo calls to targeted voters who have been identified as still holding a ballot. Although runoffs have often attracted more voters than general elections, open seats sometimes have seen falloffs in turnout. In John Hickenlooper’s first election in 2006, 6,000 fewer people voted in the runoff. Similarly, in Webb’s 1991 inaugural election runoff, turnout dropped by 9,000. Tough re-election campaigns by Wellington Webb in 1995 and Federico Peña in 1987 increased runoff turnout by 20,000 and 17,000 voters, respectively. Texas higher education politics is in an uproar, and Colorado education reformers are in the middle of the action. Texas Governor Rick Perry, who is pondering a presidential run, has launched an effort to reduce tuition costs and to increase productivity of the state’s two main research universities – the University of Texas (with 9 academic campuses) and Texas A&M (11 campuses). Major players in the effort have Colorado ties. Rick O’Donnell, now a Texas think tank consultant who formerly headed Colorado’s Department of Higher Education and was policy chief under Governor Bill Owens (also defeated Republican congressional candidate); Alex Cranberg, an oil magnate and a K-12 educational reformer (pro vouchers) in Colorado; and Phil Burgess, one time head of the Center for the New West, a now defunct policy group, which was sponsored by US West. O’Donnell has been the point person for Perry, who is using the Texas think tank to help produce analyses and recommendations to shake up the universities. The multi-year effort has caused a massive counterattack from university interest groups fighting to protect their autonomy and traditional methods of operation and compensations. One casualty was O’Donnell, who in late May was hired at the encouragement of UT Regents in a highly visible position to gather and analyze system-wide data on teaching, research and compensation. He was fired unceremoniously in a few weeks by the UT administration. Phil Burgess came to the defense of O’Donnell in a Memorial weekend guest editorial in the Austin Standard portraying his old friend as an effective innovator in Colorado. Perry is also adding like-minded people to the governing boards of the Texas state universities. Cranberg is one of his new picks for the UT Board of Regents. While the effort has been derailed for the moment, there have been a number of initiatives at both A&M and UT. The state’s higher education establishment, its supporters, and both independent and critical stakeholders are now highly engaged in the discussion. Although Colorado’s higher education system suffers from many of the same problems as those in Texas, and our major research universities are led by people with business backgrounds, reform here has been more modest and low key. Recent legislation (SB 52) calls for statewide goals and a master planning process. A similar planning effort was started at the beginning of the Ritter administration. Perry and regents need to step back. Now. Although the recent economic news is full of gloom with a dropping stock market, a double dip in home prices, sky high fuel prices and trouble abroad, sales tax revenue in the Denver metro area continues to show strength over a year ago. In April, a one-cent sales tax would produce about $34 million in the Denver metro area; that is, a 6 percent increase over April 2010. Sales tax revenue in 2010 was 7 percent higher than 2009 in the metro area. Year-to-date, the 2011 revenue is 8.8 percent over 2010. A regular political variable pollsters capture is ideology. A scale from liberal to conservative, sometimes with gradations, such as lean liberal or lean conservative, and always including a center position labeled moderate or middle-of-the-road, has been asked of Americans since polling began in earnest after the Second World War. But, the concept is well-grounded in social science. It has been around for a long time and has considerable stability. When ideology is matched with partisanship of a population there is very high levels (albeit, far from perfect) of correlation between Democrats and liberalism and Republicans and conservatism. Gallup recently published an analysis of its 2010 surveys with more than 180,000 American adults and the latest results of the nation’s ideology. Colorado is on the more liberal side of the 50-state spectrum (plus D.C.), registering 36th most conservative state and the 8th most liberal. In general, the country labels itself about twice as conservative as liberal (40% to 20%). 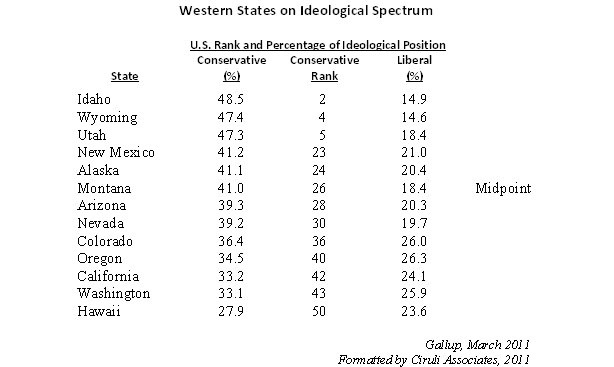 The West contains a share of some of the most conservative states: Idaho (2nd), Wyoming (4th) and Utah (5th). Mid-point western states, which are still two-to-one conservative, are New Mexico (23rd), Alaska (24th) and Montana (26th). Still leaning conservative, but on the more liberal end of the spectrum are Arizona (28th), Nevada (30th) and Colorado (36th). These states are considered battleground states for the 2012 presidential race, and Arizona and Nevada have competitive senate elections (both without incumbents). 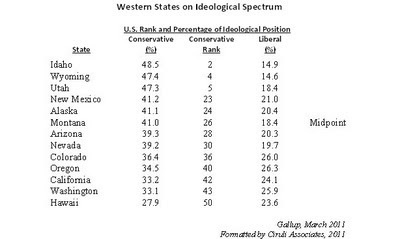 At the liberal end of the scale with less than a 10-percentage-point difference between people who label themselves liberal and conservative are Oregon (40th), California (42nd) and Washington (43rd). Hawaii (50th), the most western state with nearly as many liberals as conservatives, is only beat out as the most liberal state by Washington D.C. (51st). Liberal and Democratic candidates often win states in the west, including the inner west, because personalities, issue positions and campaigns make a difference, but importantly large numbers of middle-of-the-road or moderate voters, which represent about 35 percent of the western electorate, lean liberal in many western states or are volatile and can be persuaded to move left. President Barack Obama is betting that the Arab Spring and its populist movement is the future, and that it is in America’s interest to align with it. He is shifting American policy in the Middle East, including negotiations between Palestinians and Israelis. In using the 1967 borders as a starting point, he clearly signaled to all the participants America was adjusting positions. America’s support of change over stability sends a message to Israel that its current position is not sustainable. In this new era, it must adopt a more sophisticated strategy that includes a new negotiating position if peace is ever to be realized – or even support retained among Western nations. The administration calculated that even in a re-election year, a shift was the smart position. Obama’s strategy now aligns with the position of the liberal wing of the Democratic Party, which would advocate for a more balanced, and hence, a more pro-Palestinian policy than has been the historic American position. • Democrats and Republicans have long held significant differences in their support of Palestine and Israel, although a majority of both support Israel’s position. • The far left wing of the Democratic Party – for example, campus activists – considers itself pro-Palestinian and anti-Zionist. • Worldwide public opinion has long remained against Israel. Only American vetoes or veto threats protect Israeli interests in the U.N.
• The administration believes Israel’s inflexible position has become unsustainable in the current Middle East upheaval. Old allies have fallen and new forces will be more aggressive for the Palestinian position. Palestinians recognize the opportunities in the new environment and have unified. They are exercising renewed political and street action. The domestic potency regarding the defense of Israel’s interests has depended on major concentrations of pro-Israeli Jews in major cities, such as New York and Los Angeles, and in media, financial and political strongholds of power. But, Jewish leaders themselves tend to be liberal Democrats and are constrained by party and ideology from having a pure pro-Israeli position. Ignoring the administration’s claim that this was not a new position, the backlash from the Washington D.C. pro-Israel interests was immediate and potent. In Prime Minister Benjamin Netanyahu, Israel has an aggressive and articulate spokesperson. But, he’s playing a defensive position with a weak hand. A significant portion of Israel’s defense needs are met through American armaments. Obama’s realignment will be praised by many foreign policy realists, neo-cons and, of course, the Democrats’ foreign policy liberals. Although Republicans will try to attract some of the Democrats’ usual widespread Jewish support (upward of 75% of American Jews are Democratic), Democrats remain optimistic they will continue to hold most American Jewish support. Hispanic voters in Denver’s mayoral election could be the key swing vote. They represent between 11 (Ciruli Associates) and 17 percent (Denver Post robo poll) of the Denver electorate according to recent polls. The national exit poll in the 2010 November election indicated they were 8 percent of the national electorate and 12 percent of Colorado November voters. In the Denver poll of two weeks ago (RBI Strategies), Hispanics were closely divided between Chris Romer (43%) and Michael Hancock (37%). The latest Denver Post robo poll shows Latinos favoring Hancock 45 percent to 41 percent for Romer, reversing earlier results. Among James Mejia voters in the first round of voting, their preference favored Hancock 43 percent to 39 percent for Romer (RBI Strategies). Romer has made a major effort to win Hispanic voters using the Mejia endorsement and specific issue appeals. If he is losing or barely winning them, then he probably can’t win the election. They are a key swing group. The latest robo poll in the Denver mayor’s race appears to confirm the view that Michael Hancock leads. The best news for Hancock in the poll is not the amount of his lead (49% to 39% for Chris Romer), but the fact he is ahead. Romer, recognizing he was behind on the day after the general election (May 3), has run an aggressive campaign to raise Hancock’s negative rating and weaken him with key constituencies, including women and liberals, with attacks on Hancock’s statements related to creationism, vouchers and abortion. He’s gone after Latinos with high-profile endorsements, like Federico Peña and James Mejia. Many of the attack materials have come from an anonymous 527 committee. If Romer is not ahead 10 days out after his sustained attack, he’s likely going to lose, and it could start to slip away since some of his weaker supporters may stay home or go with the apparent winner – Hancock. As pointed out in our blog (May 27), Hancock’s win is a product of what Romer understood to be his greatest disadvantage – people like Michael more than him. One additional fact appears to be Denver’s well-networked liberal community has been able to counteract the relentless Romer attacks with their rapid, but low-key response tactics. Although Hancock appears to be ahead, the actual point spread as of May 27 could be closer than 10 points. It has been assumed the race would be more like 2,000 votes, or 2 percent. Eleven percent is undecided, and Romer has a base in older voters who are more likely to vote. Will There be More or Fewer Voters in the Runoff? The Denver electorate was only modestly engaged in the mayor’s election on May 3. Even with the convenience of mail-back voting, only 114,000 managed to participate in the May general election (39% turnout). It is possible turnout could drop below that figure in the runoff. Typically, competitive elections with advertising and get-out-the-vote efforts draw voters, but the similarity of the two candidates may lower the stakes and leave the enthusiasm of voters. And, the recent poll showing Hancock ahead by 10 points could lower turnout in both camps. Although it’s early, there does appear to be a large early return. That is not surprising given most people have already voted for their candidate in the general election. In the general election, more than one-third of the vote came in the last two days. As of May 27, 30,000 votes have been returned, 10 percent of the total ballots mailed.